So It looks like i might be coming into money soon and i wanted to build a visual library of scottish weapon designs i want reproduced. i'm looking to find as many scottish weapons as possible. Now, they can be of foreign basis but i prefer things that were Gaelicized for instance One scottish weapon, the turcael claymore, is based off of turkish kilij but was mounted to a scottish basket. 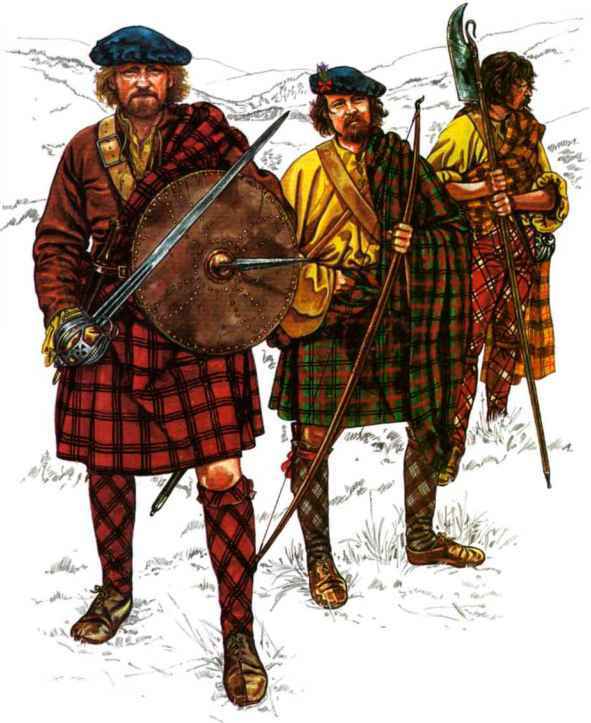 I would prefer the Turcael over the kilij because even though the kilij was used in scotland i would rather have the native variant reproduced. I will list as many as i can find with a example for others who may also want a historically accurate scottish variant of some weapon and a resource for other uses. I'd also request that if someone finds a weapon they link to a article or website showing that it is scottish. The list will be broken into 4 divisions Knives and Daggers, Single handed, Two handed, and Shields. well, later period's never been my thing - too much glorification of a sectarian civil war that still causes violence here. Yew spanned, antler-roller-lock crossbows. Used by the picts in the 7-9th centuries, some of the oldest representations of the weapon in western europe. dont think anyone's made a replica of them. 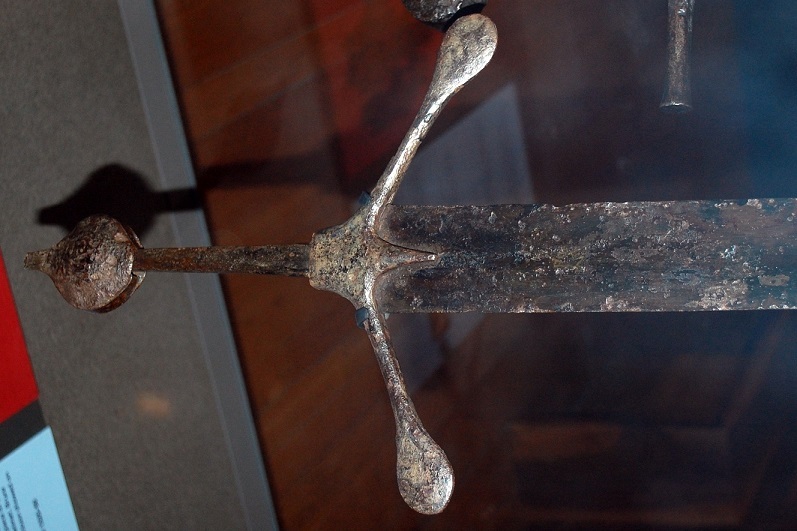 Likewise, there's some rather interesting possibilities that one of the pattern-welded swords in the National Museum that's generally considered "viking" is in fact pictish in style. I'm not entirely convinced myself - I suspect its more likely that its of Norwegian origin and that they were then used by picts, rather than being of local manufacture. but I'd love to see it recreated regardless. Later Medieval period, you get Halflangs. (They're taking the Halflangs to Isengard, to Isengard?) I've been lucky enough to take measurements and data from about half the surviving examples now. some very interesting details like hollow pommels no-one's ever properly replicated AFIK. Distinctive crosses on smaller versions are likely indicative of a northumbrian or lowlands origin, given that the Islands were something of a cultural backwater, then as now. What might be intriguing is to look at the very late useage of dane-axes and spear by the Lords of the Isles into the 15th C. Both those weapons are discussed in Claude Blair's paper in Dr David Caldwell's "Scottish weapons and fortifications". 16th C border Reivers, Latchet Trossbows. Tod's made them, and they're unspeakably gorgeous. Dudgeon Daggers. the intermediate stage between bollock dagger, and dirk. I was doing studies of several of those not long ago, so I've included a photo. Remarkably detailed knives. some of the NMS' halflangs, ( image courtesy of National Museum of Scotland.). thanks for helping get this started. Can anyone verify the veracity of this weird lance pointed targe illustration. There is a targe in one of the museums in Scotland - cannot remember which - that has a spike similar to the one in the illustration you provided. The cover of the targe is heavily decorated with tacks or nails with a subtle pattern. Whether this spike was original to the shield or not - a lot of antique targes were separated from their spikes a long time ago - is certainly debatable but there definitely is one extant today with that kind of spike. I have a photo of this targe but it is too large to attach and since I am using it in an article on targes, with the permission of the photographer, I would prefer not to tamper with the size of the image. There is also, in the user's photo galleries on this site, a photo of John Roy Stuart's targe which has a similar, though more slender spike. The gallery is Thomas McDonald's and he is the source of the photo I have. What about polearms? all i know are the lochaber, schilltron, claymore, and jedburgh ax. I've heard of brogits and scottish halberd but have never seen proof of one. i'm curious about the halflang, when did they show up, they look awfully like sabres based on that example at least what was their usage pattern? The Schiltron was a formation rather than a weapon. A Jedburgh Stave is a type of polearm. So is a "Brogit Stave" which is mentioned in the book cited below. The only description indicates it is a polearm with a projecting spear head. Whether there is an ax blade or not is not mentioned. Brogit is undoubtedly a Scots word which has fallen completely out of use. You really need access to a copy of Scottish Weapons and Fortifications which was edited by David Caldwell. It will give you some of the proofs you need in the form of illustrations and written descriptions and is an excellent reference book. The Schiltron was a formation rather than a weapon. A Jedburgh Stave is a type of polearm. So is a "Brogit Stave" which is mentioned in the book cited below. The only description indicates it is a polearm with a projecting spear head. Whether there is an ax blade or not is not mentioned. Brogit is undoubtedly a Scots word which has fallen completely out of use..
Git is not in my Scots-English dictionary but braw is translated as "fine or excellent." So that would be a "great great" if that is what git means. "Git" apparently goes too far back to be in current use. Furnished with a spike or sharp point. 1477 Aberd. B. Rec. I. 408. 1500–1 Acta Conc. II. 477. 1511 Reg. Privy S. I. 334/1. 1497 Treas. Acc. I. 352. Probably similar to the English brough, a palisade. Does anyone have any photos of dirks with guards? Hello James. Wonderful pictures of Halflangs in this thread. Have you thought of making replicas of these yourself or is it outside your interest? Also, I'm intrigued by the sword you mention in the National Museum. Can you post a picture or elaborate otherwise please. found during railway cutting in Gorton, Speyside. you'll struggle to find Gorton on any map online, but its a little area just to the northeast of Grantown, Gorton Hill, with Easter and Wester Gorton on either side. The Speyside railway cuts through just near Easter Gorton, and its probably there that the sword was found. I personally suspect its Norse and imported, based on extant examples that are very similar in Oslo, Paul Macdonald, (Macdonald Armoury in Edinburgh) argues more toward a Pictish origin. I dont think either of us could be proven right without more archaeological contexts for the find-place, which are, unfortunately, lacking. the other one in that photograph, HL.A2 is a lovely weapon - hollow pommel made of sheet brazed with copper-alloy, very forward balance point, 24cm (yes, twenty-four, not a typo) from the back of the cross). Despite that balance, it feels pretty interesting in the hand, with a grip pulling its PoB back, it would've been interesting. I'd like to make a proper replica of that, or one of the two glasgow halflangs someday. (there's the one JD Crawford posted, which is on exhibition, there's another one in the reserves in a very decayed condition, missing its pommel. I'd love to try to make a speculative reconstruction of that, with the pommel hollow brazed and gilded. But, like so many things, its a case of time/health/energy. Thanks for the reply. I see it's obvious which sword you were talking about now; my mind must not have been working that day. Very interesting information. The single-edged halflang was the one that caught my eye. In some ways it almost looks like an early Eastern saber. I'd love to see it replicated someday... The Glasgow halflang that J.D. posted is also very interesting. Thanks Mark for the headsup on Armour Class. That looks like some fine work for the money. Thanks again James for the information. Love seeing your work. I will have an email incoming to you on the paternosters you have, but I hope to work on another project with you soon. Regards.